Everything seems to align for $32,000 in 2019. Those thinking $100,000 might miss the peak. It will be 10 years later in 2029 before Bitcoin will peak again. Yet the bottom after the coming $32,000 peak will be ~$9000 in 2021. So we’ll likely rise again to new ATHs higher then $32,000 before 2025. Click here for an explanation of the details. And click here for the “prior post” that is cited in that first linked post. Disclaimer: this is for your entertainment only and shouldn’t be construed as professional investing advice. Coming PHYSICALLY settled NYSE Bitcoin futures will likely lead to approval of an ETF in 2019 so the masses and institutional money could possibly pour into Bitcoin in 2019. Important follow-up analysis is presented in a comment post on one of my other blog posts. This will be so interesting , thanks for the wonderful analysis. Interesting opinion. I think I might agree regarding price for 2019, about further future it's hard to tell. I saw your posts in "Dark Enlightenment" thread, just today somebody post new message. I see your acc there and it might be that you are not banned. Try to login, you are Hero member there with almost 5000 messages.. I think it's worth to restore that account. No I don’t personally know of Mencius Moldbug although I do know of him. I haven’t checked on Urbit progress lately. I am definitely perma-banned at bitcointalk.org. Thanks for reply and links. So why are you banned on bitcointalk - for political-philosophical reasons? I read Nicholas Taleb, I like "Black Swan", using his terminology - Bitcoin was black swan which nobody expected. But by "Antifragility" I was disappointed a bit and didn't finish. I might return to it, as some of my friends recommend it a lot and anyway Taleb is erudite, reading him is not useless. I also was disappointed that when Taleb came to my country he made paid lecture and met with exactly those people whom he calls "fragilista" and whom he despises. Also the cost of attending this lecture was higher than average monthly salary)) Small detail of course, but still I was bit disappointed. How can anyone ban ideas. Yeah the mathematical concept of antifragility seems a bit obvious to me, yet he did at least develop it formally. Agreed Taleb is very erudite (160 IQ also) and even learned several human languages, which is a feat I could never do (my SAT 580 verbal and 740 math). Are you a programmer? If yes, please add me on LinkedIn. Find my contact info on my first Steemit blog post. Apart from that I'm interested and occasionally write about geopolitics and economics, and also novels/fiction. I need programmers only. Sorry to say but attorneys, writers, marketers, graphic artists, etc are a “dime a dozen.” Become an engineer or quickly become irrelevant in the coming knowledge age. I agree, but you also know the statistics how many people with leading positions in startups have limited or no engineering skills. For me it's too late to be engineer, but there are so many other things to do in crypto, so I'm not sad about it. You’re presumably referring to the Western debt bubble of startups that will disappear over the next decade. The CEO of Intel was an engineer. Startups run by people can’t do engineering such as Elon Musk will fail as Musk is failing when we return to a meritocracy over the next decade. The leader of China is an engineer. You’re welcome. I think I remember you. You offered to translate to Korean. Thank you. When ned came Korea, my friend asked him some questions and we discuss some issue also. I haven't been to Korea yet. I’m residing in the Philippines and seems there’s an invasion of Korean TV and music into this country in the recent several years. I do think Asia is rising to be an integrated economy that will grow less dependent on exports to the West over the next decade. I see that one your top female K-pop groups visited boxer Senator Manny Pacquiao in Mindanao (where I am) this past week for a photo shoot. This is an interesting change because I remember when I arrived in the Philippines in 1990, I couldn't even get an ice cube in my soda, nor a paper napkin in any restaurant. Poverty was extreme, trash was burning along Manila bay, etc.. Asia is changing very fast. 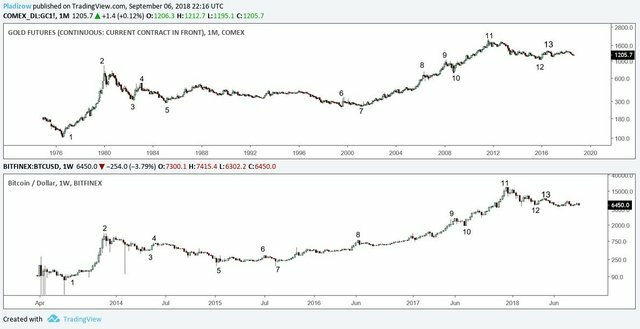 Do you have any thoughts regarding what point (maybe Cycle 5?) transaction fees might rise to such a level that Bitcoin could be unusable for the average person, if it actually did become the reserve currency? Good question. Assuming the charted model is approximately what will happen…and do note I have an alternative scenario at the posts linked from the blog… For the masses, then I think 2024 would be the last year they can still afford to transact on chain, as Bitcoin makes a new ATH higher than the $32k target peak for 2019. For $millionaires doing large transactions and most businesses, then I think by end of Cycle 4 they will be kicked off chain. Billionaires will be harvested during Cycle 5. Then finally the end of Revelation with all the world’s wealth concentrated on a hill of Israel. Lol. So, by 2024ish the more astute of the masses need to be prepared to carefully time - with dispassionate heads - when they jump ship to preserve what they've accumulated. I'd like to think innovative alternatives would have evolved and proliferated by then to accommodate the outflow of capital. Whatever scenario, definitely "Interesting times" ahead! I'd like to think innovative alternatives would have evolved and proliferated by then to accommodate the outflow of capital.